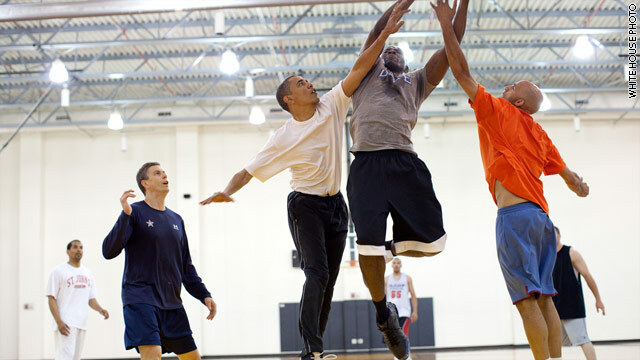 FILE/President Obama plays basketball with personal aide Reggie Love and Secretary of Education Arne Duncan in May 2010. In keeping with an Election Day tradition, President Obama took time out of his day to get in a game of hoops at a gym near his home in Chicago. The game, organized by the president's former personal aide Reggie Love, took place at the Attack Athletic facility about ten miles from the Obamas' house in the Kenwood neighborhood. Among the players, former Chicago Bulls Scottie Pipen and Randy Brown and former Illinois state treasurer and 2010 Democratic Senate nominee Alexi Giannoulias. Giannoulias gave few details over Twitter of the game and later talked to a reporter in the president's travel pool. According to Giannoulias, Obama was the player-coach of his team of five and his team won by "like 20", with a score of "like 102, 105, 108 or so to 80-something." Each team had substitutes and referees were present to call fouls. He also said the president "played very well" but declined to say how many points he scored. Education Secretary Arne Duncan, Obama friend Marty Nesbitt, the president's brother-in-law Craig Robinson and White House chef Sam Kass were also among the players. The tradition of playing basketball on Election Day has been a staple of the president's routine since the Iowa caucuses in 2008. He didn't play on the day of the New Hampshire primary and Hillary Clinton won so he's made it a priority of playing on every Election Day since. Tampa, Florida (CNN) – Reggie Love, the man by President Barack Obama's side for two years in the White House, said the president plays basketball like he leads. In an exclusive interview with CNN Chief White House Correspondent Jessica Yellin, Love said the president is a competitor above all else. 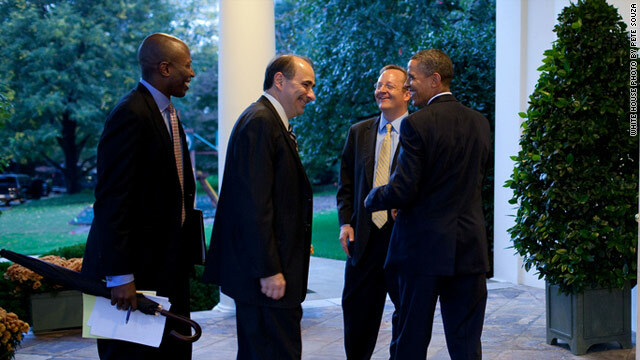 President Barack Obama chats with, from left, Personal Aide Reggie Love, former-Senior Advisor David Axelrod, and former-Press Secretary Robert Gibbs outside the Oval Office after taping an interview for the Daily Show with Jon Stewart, Oct. 27. 2010. 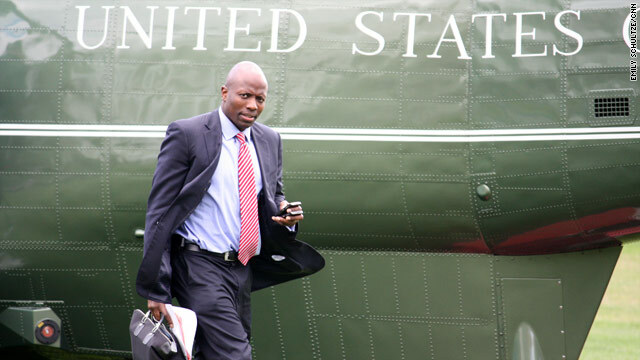 President Obama’s ubiquitous assistant and body-man Reggie Love is getting ready to leave the White House at the end of the year. Never far behind the president, Love is the man responsible for keeping the leader of the free world on schedule and can often be seen carrying bags full of briefing books and background papers as the president walks ahead unencumbered. Love began working for Obama’s senate office in 2005, and served as candidate Obama’s traveling assistant throughout the 2008 campaign. Before that he was a member of Duke University’s 2001 NCAA Championship basketball team, making him the perfect teammate for President Obama in the frequent pickup basketball games on the White House South Lawn. Love even helped organize a birthday game for Obama in 2010 featuring such NBA stars as LeBron James, Dwayne Wade, Grant Hill and Earvin "Magic" Johnson. For much of the past year – in addition to shadowing the president almost everywhere he goes – Love has been attending the Wharton Executive MBA program, and he will be leaving the White House to focus more on school. So the president might be comforted to know that Love will not be too far away. An exact date for Love’s departure has yet to be announced. 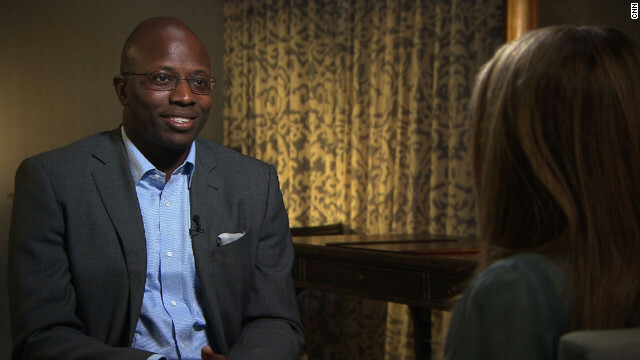 WASHINGTON (CNN) – Sometimes seen but rarely heard, President Obama’s personal aide Reggie Love came out of his shell in an interview that aired Thursday night on WRC-TV in Washington. A member of the 2001 NCAA champion Duke basketball team, Love is known to play ball quite often with Obama. In fact, Love told WRC sports anchor Lindsay Czarniak the game was a component of their 2008 campaign strategy. After the then-Senator Obama played basketball before winning the Iowa caucuses but lost the New Hampshire primary when he didn’t, basketball became part of a campaign checklist, Love said. “Obviously, I think, basketball wasn’t responsible for the outcome. It did give you some peace of mind like: ‘Not only did you make all the phone calls you were supposed to make but did you raise as much money as you could raise? Did you run the right advertisements? Did you also play basketball?’” Love said. Go inside the White House and on the road with CNN's reporters, producers, and photojournalists. 1600 provides you with an ALL ACCESS PASS inside the gates and behind the scenes. CNN's White House team is unmatched in the news we break, the content we generate, and the sheer size of the team. But don't let this be a one-way conversation, send us news tips and feedback! Some presidential movements are OTR, or off-the-record, to the public and press until the president's motorcade arrives at the previously undisclosed location.